Most organizations that will use Alfresco will want to create custom types. Associated with each custom type is a data model or set of metadata that is unique to that type of document. 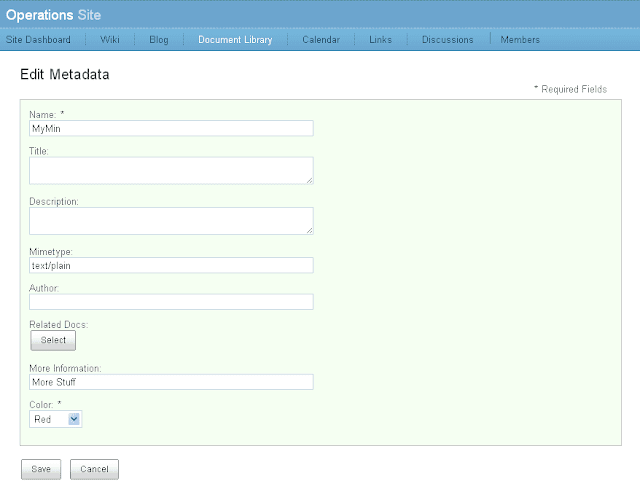 To be able to edit document type metadata in Alfresco Share, you need to define an edit form. Here's a brief example for how to set up and define the metadata for a custom document type and then how to define a Share edit form for that custom type. 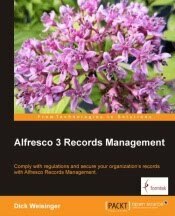 Alfresco Wiki Form Developer Guide page. Ed Loves Java on creating Alfresco Share 3.2 forms. First we define a minimum custom Alfresco type. There are four files needed to add this new type to the content model. The example files above define a simple "Minimum Content Model" for Alfresco. All of these files are kept within the Alfresco repository -- within the alfresco.war file set. The next file is on the Share side and is used to define a form within Share for editing metadata specific to the custom class just defined. With those files in place, you can checkin a document of type mm:doc from the Alfresco Explorer client and then make it available from Alfresco Share. Edit the metadata for the document, and select "Full Metadata Edit Page...". The three new custom fields are now exposed on the Share edit form: Related Docs, More Information, and Color. I am able to configure my custom types and they appear in the drop down list, but I do see one minor problem. Once the document type is changed using Change Type, it cannot be changed again. Subsequent selection of Change Type does not list the custom types, the drop down list is empty. Is this how it is supposed to work?